Here it is 🙂 The long awaited new pattern post. This pattern gave me some trouble when I sent it to testers. I realized last night (with the help of my best friend) that I was just using the wrong stitch name. It made it confusing. There are so many variations of the “star stitch”. The stitch used in this pattern is actually the “5-Star Marguerite Stitch” — so I decided to give them a lovey nick-name. Presenting the Maggie Leg Warmers! In Colorado “Fall” can mean picturesque brisk days with beautiful falling leaves in varying shades of reds, greens, and yellows. Sometimes, I walk around the neighborhood and just stare in wonder and adoration at this gorgeous place I am lucky enough to call home. “Fall” in Colorado can also mean HOT days of “Indian Summer”. It can also mean two feet of snow and blistering wind. One of the very best things about Fall? Big, comfy, lovely accessories! I’m cheap frugal, so I prefer to make my own. I’ve been admiring outfits on Pinterest for quite sometime, and one of my very favorite looks is the pairing of knee high boots with some cozy leg warmers. 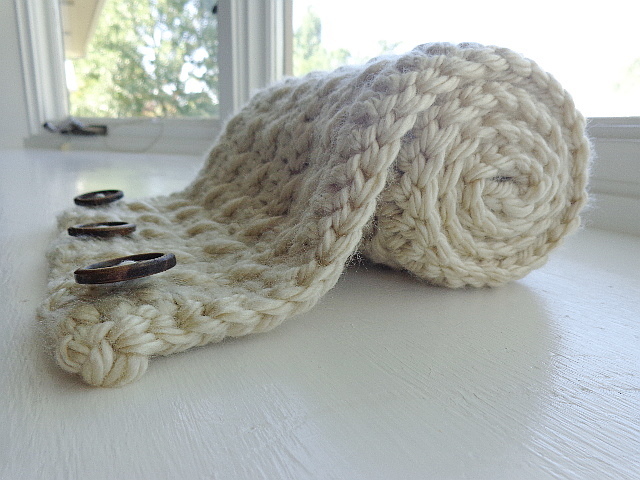 I like boot cuffs, but I wanted to come up with a warmer that can go over the boots. It took some help from testers to get it looking right AND functional, but I am happy with the end result! Now, since I’ve saved money on the accessories, I can spend more on the boots… right? *This pattern is easily adjusted to fit any size leg — Just measure the circumference of your calf before you get started, and add or subtract rows to adjust the width. This pattern is meant to overlap, so it should be bigger around than your calf. Materials needed ( ^ That is not enough yarn for a pair). I cannot find a video for this stitch the way that I do it. I had a link here, but opted to remove it. I’m going to make my own video (..maybe..) and add it here, so if you NEED the video — have no fear — it’s coming soon(ish)! For now, I’ve got that nifty photo tutorial at the end of the pattern. *Make sure you have enough material to make two. 🙂 — The amount listed is a ROUGH estimate. 2 skeins of a basic worsted weight should be plenty. Beginning chain does not count as a stitch here, or anywhere throughout the pattern. R10- 36 (or desired circumference is met): Repeat rows 6-9, ending with a hdc row. At the end of your final row, finish last st with trim yarn. fasten off, weave in ends and attach buttons to front side on the un-trimmed edge. Your double crochet row will function as the buttonholes. I originally wrote this pattern using an I hook. When I switched it up to the J hook, I also added the dc row to be used as the buttonhole row (assuming I would still need a buttonhole row). If your gauge is like mine, You really don’t HAVE to use a dc row when using a J hook (the hdc’s would have sufficed for me), but — it was already added, so there it stays haha! Feel free to move that dc row to wherever you would like your buttonhole row to be (Just switch it out with a hdc row). As long as it’s near the beginning somewhere, you should be fine. Also, I considered making it taper down — I didn’t. On purpose. I didn’t design these legwarmers to go over leggings. I designed them to go over BOOTS, so they are supposed to be a little wider around the bottom to accommodate boots. Personally, I think the pair I made for myself look pretty darling slouching over my foot a little without the boot, but that might just be me. Who else is in love with the texture of the Marguerite Cluster Stitch?? I LOVE this texture — it makes me want to pet it. Categories: How-To Tuesday | Tags: Arts, Clothing, cold weather wear, Crafts, crochet, crocheted accessories, DIY, Do it yourself, fall, fashion, handmade gift ideas, How to crochet a pair of leg warmers, How to crochet the marguerite cluster stitch, how to tuesday, Leg warmer, legwarmer, marguerite cluster stitch, winter | Permalink. Lilly has been up all night with an ear infection, so I’m going to try to get this written and posted before the doctor’s office opens. Fortunately, she doesn’t seem as miserable now as she was from midnight to 6 am. There’s something about the middle of the night that makes all illnesses worse, am I right? Anyway, on to the pattern! This one is pretty simple, so I didn’t have it tested, so please don’t hesitate to let me know if there is anything weird about it, but I’m *pretty sure* it should be easy to follow. This pattern is definitely both of these, so I figured I had a keeper this week! Super Bulky yarn (I used Lion Brand HomeTown USA in Los Angeles Tan) — Just under 2 skeins made the one pictured. The end! Super easy, right? Love these buttons — what a find by my daughter! It’s so soft and warm! I’ve had a question about stitch placements in the row following the xst row — here are some pictures to help clear up any confusion! Categories: How-To Tuesday | Tags: bulky yarn, Craft, crochet, DIY, fall fashion, Fiber Arts, Hobby Lobby, how to crochet a cowl, how to crochet a scarf, how to crochet the cross stitch, how to tuesday, Supplies, warm accessories, wood buttons | Permalink. I am going to totally shock you all today and post a pattern for something that is NOT a slouchy hat! You know I love some slouchy hats, but I thought I’d change it up a little this week. Also, I wrote this pattern over a year ago, so most of the work was already done. And who doesn’t love fingerless gloves, right? They’re cute, warm, and allow you the freedom to answer calls and texts without taking your glove off! Chain 30 Row 1: In 3rd ch from hook, hdc blo, and every st until the end (28 hdc) Rows 2 – 17: Ch 2, turn work, hdc blo next st and down the rest of the row (28 hdc) (measure against your wrist – if not yet big enough to go around, make another row and measure again), do not fasten off. Row 18: Joining row – Ch 1, sl st two sides together creating a seam up the side of your work next 20 sts. At st 21, sl st up only one side of seam (creating hole for thumb) for next 7 stitches. Ch 1, sl st into final chain, joining work and creating the hole for your thumb. Do NOT fasten off. Thumb Hole: Sc around your thumb hole (16 sc), do not join rows, sc 4 rows (16 sc each) or until desired length. Fasten off, weave ends. Turn your work inside out. Bottom Cuff: Join yarn at side seam. Row 1: Ch 2, HDC around (approx. 24 hdc* see note below). Join with sl st into top of beginning stitch. Row 2: Ch 2, hdc blo each stitch (24 hdc). Join with sl st into top of beginning stitch. Fasten off (or make more rows until desired length), weave ends (into the inside of your work). Top Cuff: Join yarn at side seam. Row 1: Ch 2, hdc around (approx. 24 hdc* – see note below). Join with sl st into top of beginning st. Rows 2-4: Ch 2, hdc blo around (24 hdc). Join with sl st into top of beginning st. Row 5: Ch1, sc blo around (24 sc). Join with sl st into top of beginning chain, fasten off, weave ends on the inside of your work. Strap: Ch 15 Row 1: hdc into 3rd ch from hook and down (12 hdc). Rows 2-3: Ch 2, hdc to end (12 hdc). Fasten off. Leave tail long enough to sew onto glove. Whipstitch onto glove just below the thumb hole (see picture for placement). Add button to the opposite end of strap, whipstitch button side onto glove (see picture for placement). –And I know this sounds dumb and should be a no-brainer, but I wouldn’t include it if I hadn’t stupidly done this before myself (ha! I was SO mad! ): Make sure you don’t accidentally create 2 right/left gloves by misplacement of strap — With thumbs placed to the inside (next to each other), you should have one glove with a button on the right side of the glove, and one glove with a button on the left side of the glove (Right glove/right side button, Left glove/left side button). *Approx 24 stitches around, possibly more if you needed more original rows in body to adjust for your wrist size. This is what they look like without hands in them. Kind of like little fire hydrants haha! So pretty (if I do say so myself). Categories: How-To Tuesday | Tags: crochet, fingerless mitts, free pattern, how to, how to crochet fingerless gloves, how-to tuesday, texting gloves, vickie howell sheepish, Yarn | Permalink. Are you all ready for this week’s pattern?! I know I am. This one is a little more complicated than what I’ve posted so far, but I’ve had it vigorously tested (ha!) and am confident that you will be able to follow. And if you can’t, I’ve gone over it enough times that I should be able to answer any question about any row off the top of my head. I have lived and breathed this pattern since Friday night. I’ve altered the first few rows from the original design to make it less confusing, and I’m happy with the way it’s turned out! Note — try not to stitch too tightly in the first few rounds. If you know you typically stitch tightly, maybe go up a hook size for the first 4 rounds or so (maybe even the first 8). I’m going to try that on my next one to see if it makes the top come out a little less “pointy”. Pay very close attention to your stitch counts and placements in the first 8 rows (especially rows 6, 7, and 8). These rows might literally kill me. I hate math, and it shows in the wonky stitch counts in these 3 rows. It WILL work if you are diligently paying attention. I promise ♡ It’s not hard, just easy to lose count. dc2tog; double crochet 2 together – yo, insert hook into st, pull up a loop, yo, pull through two loops on hook, yo, insert into next st, pull up a loop, yo, pull through two loops on hook, yo, pull through remaining (three) loops on hook. join: connecting a completed row by placing a sl st into the top of the beginning chain. blo: back loop only — inserting hook into only the back loop of the stitch. Last sts of round 4 — you’ll have an extra. skip it. Round 6 — beginning shell (ch 3, 2 dc same st) ch 2, but skip 3 just this once. Categories: How-To Tuesday | Tags: crochet, DIY, flower top hat, free pattern, How to crochet a slouchy beanie, how to tuesday, make it yourself, ravelry, rosie, tutorial, Yarn | Permalink. I sincerely apologize for the late edition. I dropped the ball and was late asking for testers, then ran out of daylight to take pictures.. Anyway, I hope you enjoy today’s pattern! Today I am sharing with you one of my absolute favorite things to make. The puff stitch hat (slouchy version). 1. They’re pretty flippin easy and fast to make. 2. They’re super cute — always one of my best sellers at craft shows. I’m currently building up my stock for an upcoming two-day craft show next month, so I’ve been whipping these up like crazy. Woop! Love slouchy hats, love the puff stitch version — LOVE this Bernat Mosaic variegated yarn! Categories: How-To Tuesday | Tags: beanie, crochet, free pattern, hook, how to tuesday, Magic ring, puff stitch, slouch hat, slouchy, tutorial, wednesday, Yarn | Permalink. I seem to have caught the Chevron Mania. Well, in honor of the mania, I’ve written up a pattern/tutorial for this awesome Chevron Slouch beanie! I hope you enjoy! I haven’t written many patterns, and have only had this one “tested” by myself. Please don’t hesitate to point out any mistakes, or ask questions if there is anything that doesn’t make sense to you. I love this pattern because it’s super easy once you get the rhythm down — that is awesome because it allows you to watch TV or carry on a conversation without losing your place. But, if you DO lose your place, it becomes apparent before you get too far, so it’s easy to go back and fix a mistake (maybe ONE row later, rather than when you’re sewing up the seam). Keep going until your brim is your desired size (mine is about 5 rows) and fasten off and weave in your ends! As you can see, this pattern is easily adjusted to a variety of material. The WW version worked up VERY quickly. *This particular pattern makes a slouchy hat that fits MY head. I’ve been told I have a relatively small(ish) head. If it’s not long enough for whoever’s head you’re hoping to accommodate, just add rows as needed until you reach the desired length. I like the look of ending with one row of Color B and edging with the brim color, but get creative! I would love to see what you all come up with! Please post your pics (or links to them!). Categories: How-To Tuesday | Tags: chevron, Craft, crochet, DIY, free crochet pattern, how to, how to crochet a slouchy chevron beanie, how to tuesday, slouchy hat, Yarn | Permalink. I think Mr. Bob Ross may disagree on the “one can never learn how to paint” (happy little trees..ha! ), but what a beautiful quote. Some colors do just sing, don’t they? Lovely. I feel the same way about some yarns.. Anyway, on with the post. When I started this blog (about a month ago! Time sure flies! 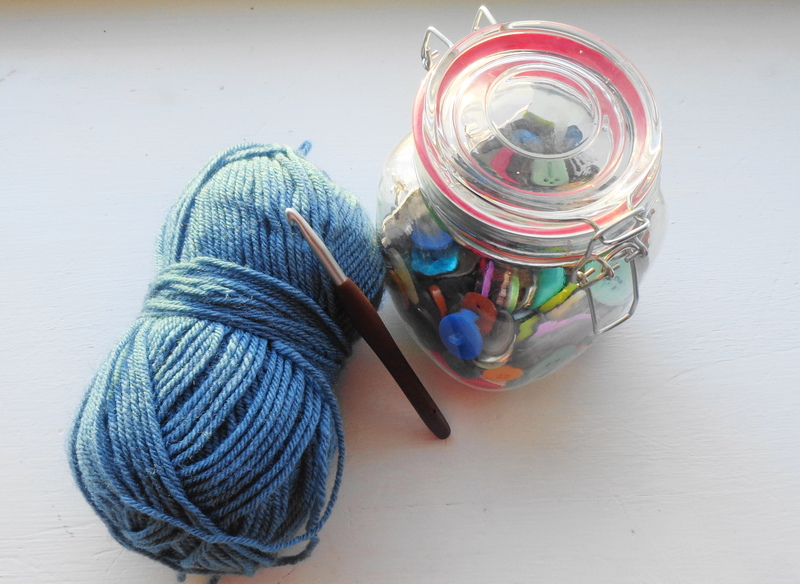 ), I reached out to fellow crafters and asked what they would like to read about. One crocheter asked how to choose colors for projects. Now, I don’t particularly consider myself an “expert” in anything really, but I happen to get quite a lot of compliments on my color choices. I’ve been struggling a little with how to describe my process for you. I think, because honestly, it’s mostly just intuition. My best projects are those I don’t have any problems picking colors for. Sometimes, I decide the color scheme before I even decide the project, like the yarn is asking to be used. I’ve even not started projects in the past because when I started thinking about what colors to choose it would give me anxiety, and who wants that?! This is supposed to be fun, and stress relieving, not inducing! Tip: When I’m having a hard time envisioning how my colors are going to come together in a pattern, I actually grab my colored pencils and sketch it out. This has led to color scheme changes more times than I can count! So. Here goes. Some *hopefully* useful methods to assist in choosing color schemes. Get Online – We all want to create things that everyone considers beautiful. I’m not saying go copy whatever is popular in cyberspace. I’m saying, one of the best ways to find out what color schemes are “hot” is to do a quick search of your favorite online shopping sites. Let it inspire you. Get Outside – Mother Nature is gorgeous if you’d just look at her! Head outside. Lift your head and look around. Stop looking at your phone 😛 (I’m guilty of that one sometimes). What do you see? More likely than not, some amazing colors! This is the Foote Lagoon near the library here. Look at all of those gorgeous greens and blues! Go Shopping – At the home improvement store. The paint sections at The Home Depot and Lowe’s are wonderful resources for finding gorgeous color palettes — AND they’re already put together for you! For FREE! Go grab some swatches! Example of some paint swatches you will find at The Home Depot — pretty, right?! Experiment – Step outside your comfort zone. Go BOLD. Something. Just try something you wouldn’t normally try. If you’re apprehensive about potentially wasting time on the wrong colors — do what I do. Grab your colored pencils and sketch pad and release your inner artist! Some of us have an easier time “stepping outside the box” .. I once bought what I considered to be a fantastically beautiful skein of yarn, only to come home and have my teenager announce that she thought it looked “vomit-ish”. Lo-and-behold, when I completed the scarf I intended it for, I was overwhelmed with compliments on, you guessed it, the colors! Even my opinionated teen later admitted that, when paired with the gunmetal grey, the chartreuse (yes.. really) actually looked quite good. Scarf in question — what do YOU think? Color is more complicated than it seems. I’ve taken whole classes centered entirely around color theory and choosing colors that complement each other (in hair school, not for crafting, but someone should offer one!). Get friendly with a color wheel and learn the basics of color theory. This site has a wonderful (and easy to follow) explanation: http://www.colormatters.com/color-and-design/basic-color-theory. It really is helpful to get to know the basics. Happy Tuesday! What colors are you currently working with? I’d love to hear what inspires you in choosing colors! Feel free to add your two cents in the comments. Any totally odd color combos that have just worked for you? Categories: How-To Tuesday | Tags: bold, Choice, choosing color, Color, color pallette, Color scheme, Color theory, Color wheel, crochet, Graphics, Home Depot, how to, inspiration, Knitting and Crochet, Tuesday | Permalink.